When he was tapped to renovate a unit in a magnificent, early 19th-century Haussmannian edifice near the Trocadero in Paris—architect and interior designer Guillaume Alan knew right away that light would play a starring role in his redesign. The top-floor unit boasts gorgeous, 360-degree panorama, which includes views of the Seine and the Eiffel Tower. The homeowners—a French couple who have been Alan’s clients for years, and fans of his simple and elegant furniture designs—are frequent travelers who were looking for a living space that was as spectacular as the luxury hotels and villas they’ve experienced around the world. However, they were also looking for a home that was "livable and fun": a home where they could entertain with ease. For the entry, Alan created a series of high stone ceiling arches with recessed mirrors inspired by The Orangery in Versailles. The original mosaic floor was kept and seamlessly worked into the redesign. The classic residence required a total reorganization of the space. 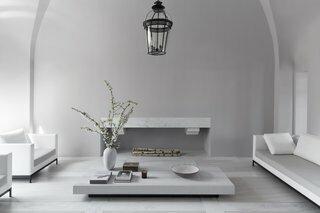 Alan approached the project with his signature sense of minimalist style, employing a monochromatic, light gray color palette which he refers to as craie (chalk). 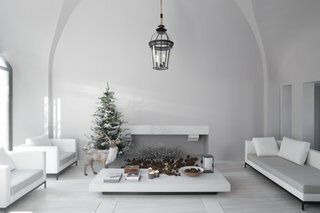 The subtle tones weave throughout the home and even expresses itself in the diverse material palette: floors of light gray brushed oak with natural marble accent lines, bespoke furniture made of brushed ash wood, and textiles of linen, leather, silk, and wool. The designer even embraced found elements, such as the original mosaic floor in the entry which features beautiful, degraded tones of grays, bronze, and antiqued gold that complement his palette. The living room is a wonderful example of Alan's signature minimalist style. From the clean treatment of every single surface to his flawless definition of space—the designer's work is an exercise in restraint. 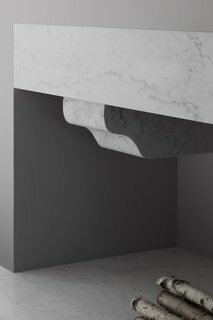 The bespoke fireplace is almost 10 feet long and was carved from a single giant piece of natural Carrara marble. The design "gives the feeling of floating weightless in the air." A close-up detail of Alan's fireplace design. 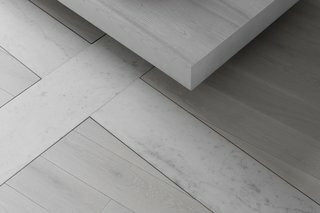 A detail of the light grey brushed oak floors with marble accent lines. 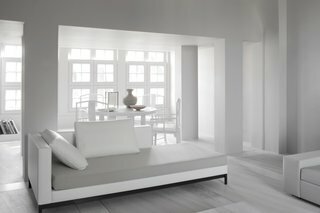 Alan crafted custom furniture for the residence and also selected furniture from his eponymous line, Guillaume Alan Collection, in bespoke dimensions. 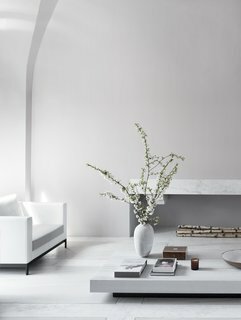 The result is a luminous, light-filled residence which embodies a sense of classic, minimalist elegance that the homeowners will enjoy for years to come. The vaulted ceiling creates a grand sense of space. The large window was inspired by an old door the designer saw on a trip to Oxford, England. A view from the living room back towards the entrance hallway. The sofas and the coffee table are both custom-designed by Alan. A bespoke, upholstered satin chaise provides a smooth transition into a bright and airy dining room, which features custom-made chairs inspired by vintage Chinese armchairs and a custom Corian-topped table with a textured, brushed ash wood base. Light makes architecture. It’s thanks to the light that walls, space, and shadows can exist. The same theme is carried out in Alan's execution of the kitchen and breakfast area. The same Chinese-inspired armchairs found in the dining room were used, as was the natural Carrara marble. "All the rooms in the apartment are linked by materials and palette," says Alan. 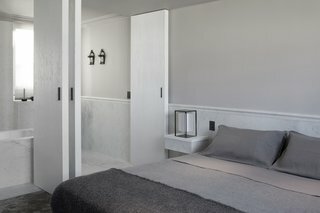 In the master suite, handcrafted, double-pivot doors in a brushed ash finish create an ensuite bathroom that can be fully opened up or closed off. 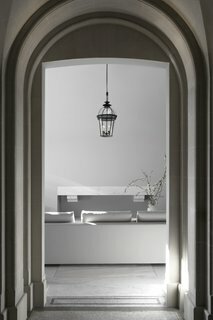 Carrara marble molding outlines the room and provides an extravagant touch. 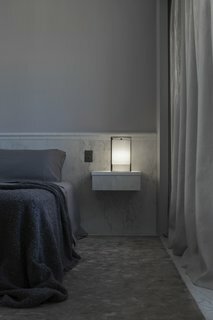 The brass bedside lamp with a silk lampshade designed by Alan sits on a marble and ash wood floating nightstand. 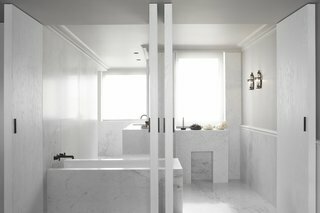 Luxurious and minimalist, the bright master bathroom appears to glow. 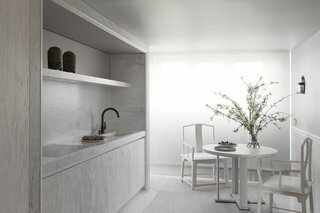 The perfectly balanced space features Carrara marble, textured handcrafted ash wood doors, and softly tinted paint. By using the same tones throughout the apartment, Alan unifies the residence; creates the illusion of more space; and allows for greater depth, texture, and warmth to be added to each individual room. 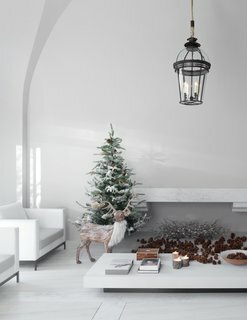 It also helps serve as the perfect backdrop for elegant and understated holiday decor.